She grabbed about 1/2 cup of butter with her knife and... well... you know tricky butter can be... all slippery and evasive like...she dropped most of it right on to my computer. (Honestly though, compared to the gold dust I got all over the screen and maybe a wee bit into the keyboard last week, the butter was not a super big deal.) She froze...just staring at me. I looked up and asked her, "Did you just drop butter all over my computer?" Completely blank stare lasting at least 12 seconds. 1. Grab some medium consistency white icing and pipe something that kind of, maybe, looks like a unicorn body. Use a #1.5 tip to pipe gray icing on the bottom of the face. Let dry for 15 minutes. 2. 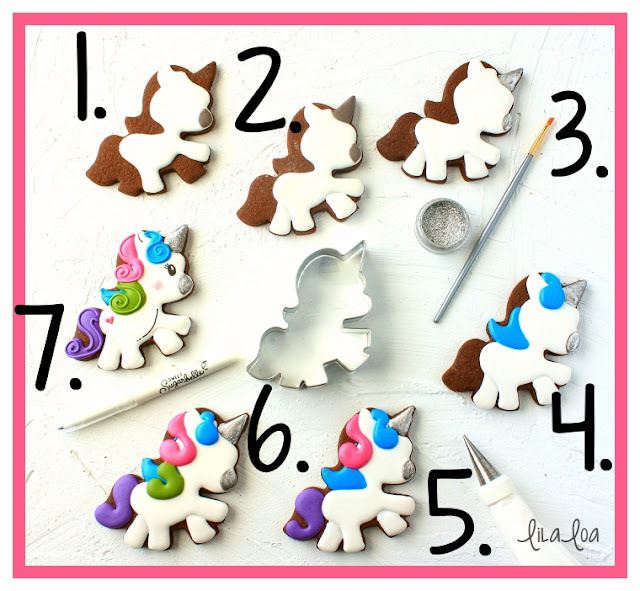 Add a horn with the same gray icing and back legs with the white icing. Let dry for about an hour. 4. 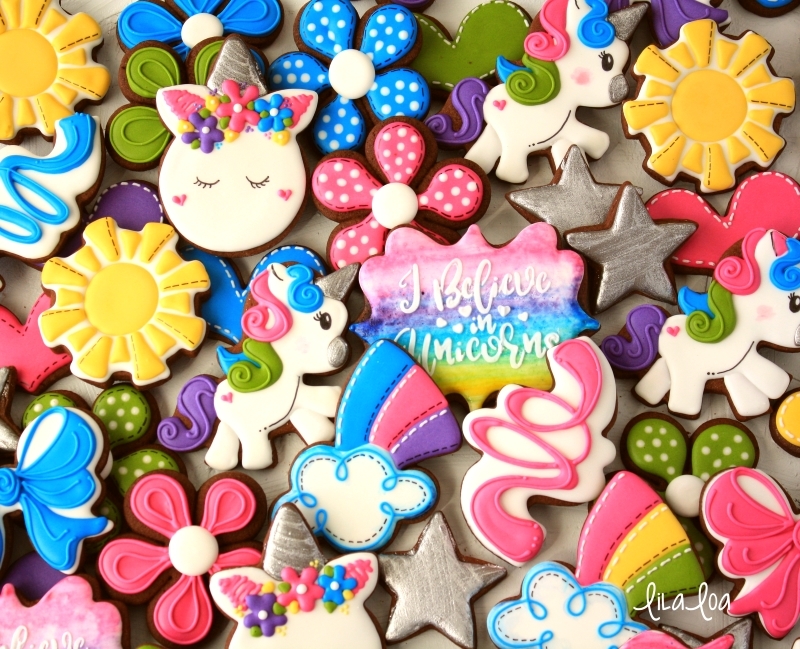 With blue icing, pipe a lock of hair at the top of the head and at the bottom of the mane. Let dry for 15 minutes. 5. Add a lock of pink hair to the mane, just under the ear. Pipe the tail with purple icing. Let dry for another 15 minutes. 6. Add one more lock of hair to the mane with green icing. Let it all dry AGAIN for 15 minutes or so. 7. Put a #1.5 tip on all the colors you use for the mane and tail and add details to the locks of hair. Use a black food color marker to add detail lines on the body and ears, and to draw an eye with eyelashes. Pipe a tiny pink heart on the back end and add blush to the cheeks with watered down pink food coloring. 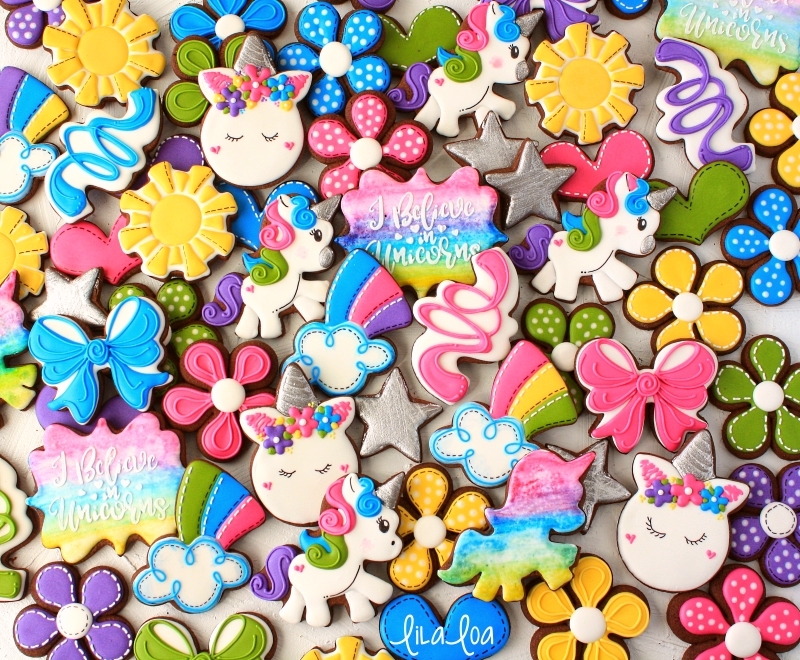 Grab the cutters: Full Body Unicorn, Unicorn Face, Rainbow/Cloud, Confetti, Heart, Sun, Flower, Plaque, and Bow. Get more supplies: Black Food Color Marker and Silver Luster Dust. See my tutorial for UNICORN FACES. Check out Sword's Sugars tutorial for the most PERFECT BOW COOKIES EVER. 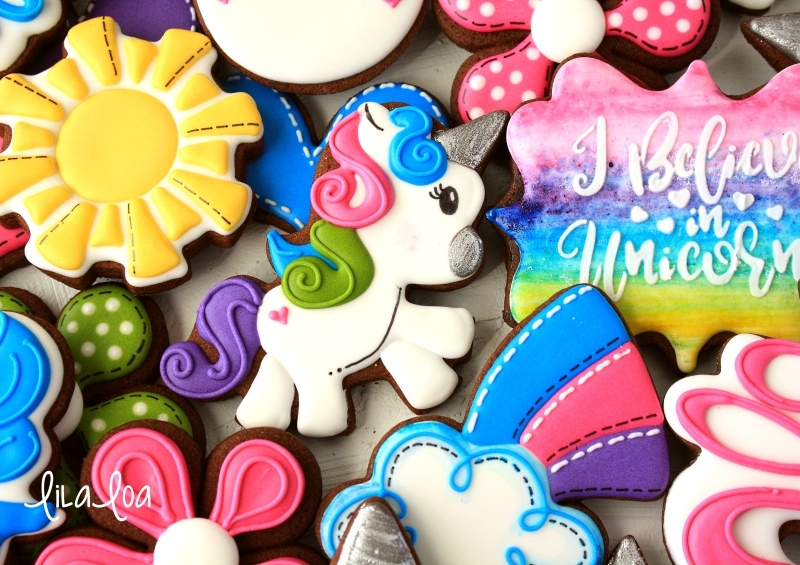 And don't forget my CONFETTI RIBBON COOKIE tutorial.